Scott Nylon Dog Boots -- Set of 4. $22.95. We coat the bottom of the boot with truck bed liner or plier handle rubber makes them last a lot longer. English Pointers. Hunts. Family pet. Best overall value and performance. These boots are a life saver for my dog. They stop sand burrs and anything else you can throw at them. Just make sure you take the time to tape them onto your dog for a secure fit and they work great. I use vet wrap and then gorilla tape over top of that and the velcro straps. For the price I would highly recommend them. It's a really good product! I used these boots in heavy Texas cover to protect mainly against sandburs. They did a great job and didn't slow my dog down at all. I did use some white medical tape to make sure the Velcro straps didn't come loose on long hunts. Highly recommend these to protect your dog's pads. I have been using them for several years. They last. I have purchased these boots several times over the years and love them for my dogs!! They are the ONLY boots I've found that stay on and are durable. My dogs don't mind wearing them and haven't had any issues with them. Plus they are affordable and were shipped right away. Highly recommend the boots and this company! Works great for the sand burrs here in Nebraska! Best and easiest boots for terrain in Nebraska panhandle. These boots are FANTASTIC. Our second pair. 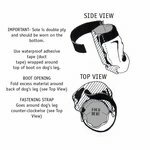 Recommend everyone in the market for dog booties try these out. I needed something simple yet effective, and this was the ticket. Tons of boots out there, and they all look great, but the paw needs to fit, not a human foot. Many of the rubber padding areas and angles of other boots limited Timber to fit paw securely in and still have his foot in a natural position for him. These did the trick! "Always good service and products from GDS." The fit is great. Well made product, and they came within a few days of ordering. Always good service and products from GDS. "These nylon boots are excellent for our South Texas hunting." These nylon boots are excellent for our South Texas hunting. They protect the dogs from thorns and sand burrs. Product was shipped quickly and great packaging! Have ordered from Gun Dog Supply for several years now. Long time customer. E-collar I got from you over 8 years is still going strong, model Dogtra. Always get my products on time. Will always be a customer. 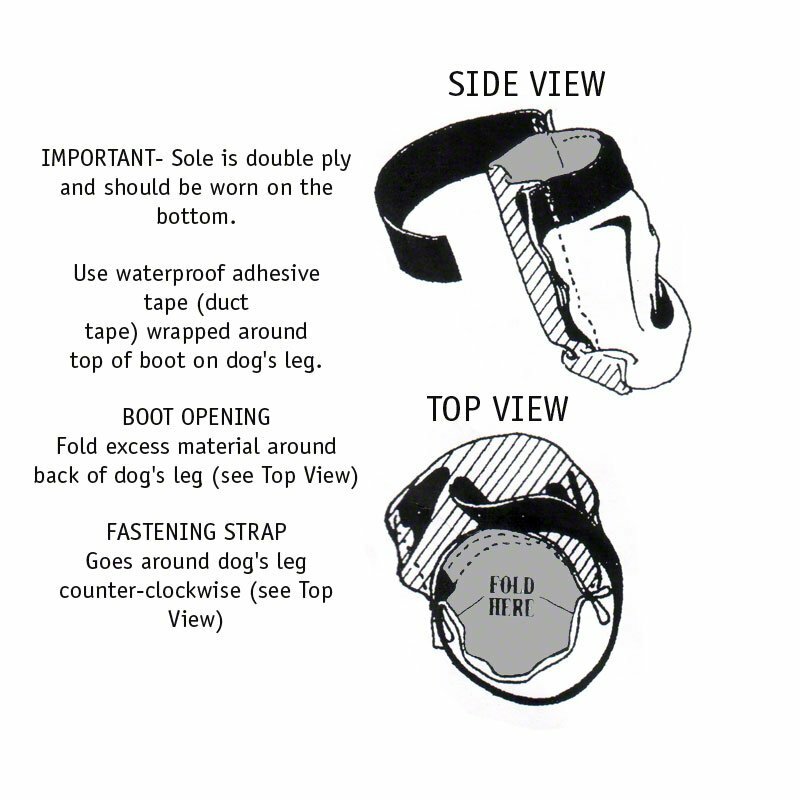 On the booties for the dogs in South Dakota (sand burrs) it is OK to alternate top and bottom. The dog does not know. "They were used 5 days in a variety of weather conditions. No problems with paws." A great product for the money. Because these boots are not a tight fit, there is not wear or irritation of the paw, despite being worn all day. They were used 5 days in a variety of weather conditions. No problems with paws. 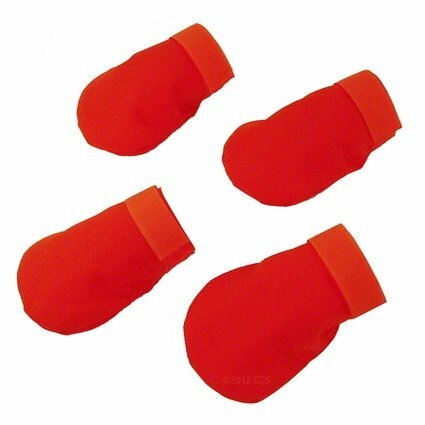 I purchased these for my senior dog to prevent her from stepping on scorpions in the yard. They would have been the perfect boot: lightweight yet the bottoms were reinforced and thick enough. Unfortunately, her skinny old ankles would not hold them up. The instructions do say to use tape to help the velcro, but again, being a senior with many medical conditions, this was not an option. When I called customer service to ask how to return them, the associate was polite and helpful! I mailed them back and within days I received my refund. Excellent customer service! "These boots are easy to put on." "For the price of these boots, you cant beat them." For the price of these boots, you cant beat them. "I run trails with my dogs several times a week, and these booties are hands down my favorites." I run trails with my dogs several times a week, and these booties are hands down my favorites. I won't get anything else. They generally stay on. Based on my dogs, they are more comfortable than any of the other brands we've tried. When they do fall off, they are easy to find, and they are easy to wash. My Britts are both on the big side for the breed, 45 & 50 lbs, and the mediums fit well. "Our Boxer has a disability where she can no longer use her back legs. When we walk her, we use a sling to hold up her hind quarter, and her feet drag on either the grass or a hard surface." Our Boxer has a disability where she can no longer user her back legs. When we walk her, we use a sling to hold up her hind quarter, and her feet drag on either the grass or a hard surface. We've spent hundreds trying other types of foot protection, but this is the only boot that protects. It's flexible and stays on her feet because of the velcro top. Plus they're easy to clean and dry quickly. Works well and double layer on bottom should make these last longer. "They are not meant to be super durable, any conditions booties. We use booties with rubber bottoms for that." These booties are a good all-around protection for the dogs' feet. We used them in the winter when it's single digits and below zero, so that the dogs can go outside for awhile without the 'ouch, paw lift'. They are not meant to be super durable, any conditions booties. We use booties with rubber bottoms for that. I bought these boots to prevent my dog from digging on my lawn. Due to the fact that I have only had them for a short period of time I honestly can't give an opinion as to their reliability and sturdiness. I only put boots on her front paws and take them off whenever we go for daily exercise. They are very easy to put on, which is great. Better to wrap legs and the top of the feet with vet wrap before putting on boots. Also add a tab of duct tape to the top of boot so that the duct tape holds the boot better. Of course there is duct tape of good quality as well as poor quality. Have only had the chance to use them a couple days, but they seem to work well and after taping them on I never lost one! Good product for the money. The boots work really well if you wrap duck tape backwards around the dog's leg before putting them on. The tape holds the boot up, or else they slide down and look like clown shoes. Won't use them until next fall, but i figured I'd get them now, so I don't forget. "Thanks for such a great, reasonably priced product, Gun Dog Supply!" My 15 year old lab has trouble getting around these days, and it's complicated by the dry, rough terrain of West Texas. She needed something that didn't hinder movement, but provided just enough cushion to keep mesquite thorns and small rocks out. I am afraid they don't breathe very well, and given that dogs sweat and cool themselves through their feet, I try to keep them on only when needed. She is not very active anymore, and her boots stay on well for light use. We just have to adjust them when they get twisted. Overall, they are great for what we need. When these wear out, I'll buy another set! Thanks for such a great, reasonably priced product, Gun Dog Supply! "Good boot for the money." Boots fit well and stay on very well. Good boot for the money. "Best value for the price." Definitely tape the Velcro with duct tape as recommended. "I'm sure she would have gotten used to them if I kept them on her." These are not bad for the price. I got them so my dog wouldn't scratch up my in-laws wood floors. They are pretty slick for her to walk on the wood floors. She didn't like them one bit. I'm sure she would have gotten used to them if I kept them on her. Easy for the dog to run in, but didn't last. After two days of hunting, the bottoms completely wore through. Protects your dog's feet from rocks, burrs & brush. These boots are easier to put on and take off but are not as durable as rubber boots. NOT intended for use on pavement or concrete. Sizing by Paw Width: Small -- up to 2 3/8"
Medium -- up to 2 3/4"
Large -- up to 3"
X-Large -- up to 3 3/8"